In their December Insight report Freddie Mac's economists estimated the country will fall short of its housing needs this year by about 2.5 million units. Yet at the same time, fewer members of the Millennial generation are buying houses than young people did in earlier periods. This month the Insights report examines the intersection of these facts, asking who is living in those homes that young people were expected to buy, and how this relates to the shortfall. Freddie Mac' research finds that today's seniors (persons born after 1931) are staying in their homes longer, and aging in place. While Millennials have historically low rates of homeownership the rates among seniors are high relative to previous generations. The company estimates that this trend accounts for about 1.6 million homes that have not been available for sale. This represents about one year's typical supply of new construction and about half the 2.5 million units need to meet demand. This gap will increase the relative price of owning versus renting, making renting more attractive to younger generations but it also puts upward pressure on both house prices and rental rates. The research compared homeownership rates for seniors aged 67 to 85 in two different periods. The current crop of seniors, they call them the "Good Times" cohort, were born in some bad times between 1931 and 1941 but with the benefit of relatively good times through their lifetime. The "previous generations" combines the generation born before 1924 and the "children of the Depression" born between 1924 and 1930. To reach their estimate of how many housing units have been held off the market by recent cohorts of senior citizens, the economists engaged in a thought experiment and evaluated a "counterfactual." What would have happened if the Good Times cohort had behaved like prior generations? Since the diversion between the two cohorts begins at age 67.4, they used the pattern of the previous generations to develop a scenario to answer that question. They broke the groups into three age groups: 68 to 75, 76 to 80, and 81 to 85, and calculated the homeownership rates for each group in both the Good Times cohort and the previous generations based on Health and Retirement Study (HRS) data. 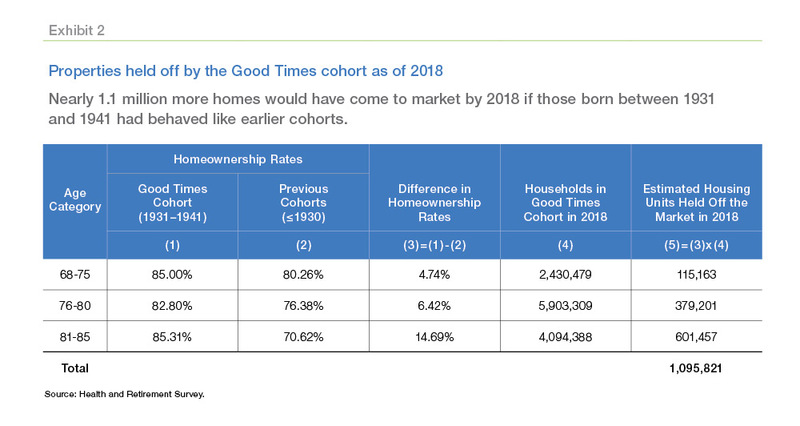 As shown in Exhibit 2, even at ages 81 to 85, the homeownership rates for the Good Times cohort are still above 80 percent. By contrast, homeownership rates fell to 71 percent for previous generations. 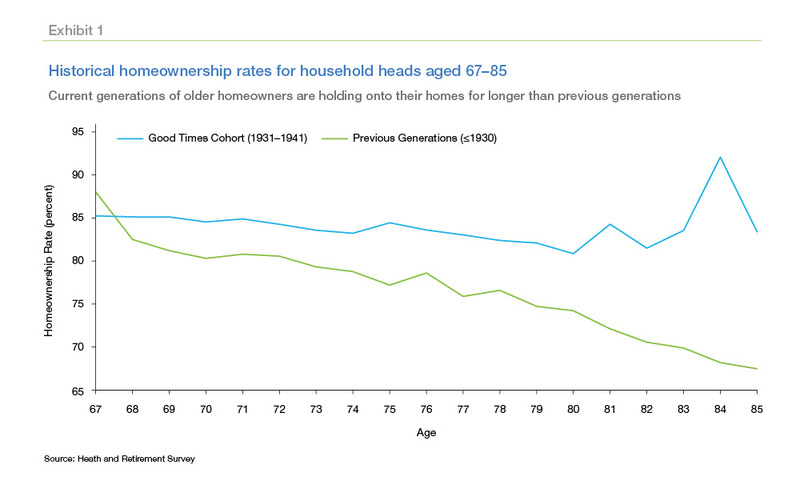 The wedge in homeownership rates between the two groups is as large as 15 percent at ages 81 to 85. They then multiplied the number of 2018 households (obtained by applying age-specific survival rates to the 2014 estimates from the HRS survey) by the generational differences in homeownership rates. These estimates suggest that had the Good Times cohort transitioned as previous generations did, there would have been around 1.1 million more housing units available by 2018. Exhibit 2 breaks down the number of housing units by age group and shows that 115,200 housing units would have been supplied to the market by respondents aged 68 to 75; 379,200 by respondents aged 76 to 80; and 601,500 by respondents aged 81 to 85. Generations that came along after the Good Times cohort, the "War Babies" (1942-1947) and "Baby Boomers" (1948-1959) are also expected to stay in their homes at higher rates, and thus contribute even more to the number of houses held off the market. Similar calculations for those two groups lead to an estimate that an additional 550,000 homes were held off the market by these cohorts by 2018, as shown in Exhibit 3. The combined total of 1.6 million units is 2.1 percent of total owner-occupied housing units in the United States as of 2018. In this counterfactual, the seniors that transition from homeownership to renting would free up more owner-occupied housing units, but also would increase demand for rental units. Note, the higher propensity of homeownership by seniors would not lead to shortages in those markets with elastic supply because any shortfall would be offset by an increase in the housing stock. The economists conclude that the most important fundamental in today's housing market is the lack of houses for sale. It has been identified as an important barrier to young adults buying their first homes and seniors choosing to age in place are contributing to this shortage. The amount of homes retained by seniors is likely to grow as both the number of seniors increases and the barriers to staying in place are reduced. This highlights the importance of addressing barriers to the production of new housing supply to accommodate long-term housing demand. It is been suggested in our high priced and high rent community that Seniors who are empty nesters could share their home with the right, well screened tenant (s). To some extent that is occurring as at least one agency in the area helps Senior homeowners match up with house share renters. Another good suggestion has been to allow homeowners a fast track to being able to add an apt. to the home, and there are homeowners who have taken advantage of that. Nonetheless, these efforts at producing more rentals, and hopefully more affordabiiity to the market, have barely put a dent in alleviating the situation of too low a number of housing units and high cost. One problem is that here in Ca. you have Proposition 13 keeping property tax payments extremely low compared to property taxes applied to more recent home purchases; that makes the decision for Seniors to sell more difficult. i wonder how many retiring baby boomers want to live somewhere else when their community has the best weather and their family resides nearby along with good cultural and social activities they plug into. Finally, at least in desirable areas people like to come for extended stays, there may be a number of Seniors able to take advantage of a strong "air b&b" marketplace. That certainly can help Seniors earn extra to remain in their home in retirement as well as limit the available long term rental stock, Hitting "senior status" myself and my wife just several years behind, we wonder where on earth do we want to live other than in a location fantastic weather, a Bay and an ocean nearby, and lots of great social and cultural activities available to us? In our area most if us agree we have to keep building affordable housing for Seniors and vital lower income residents. We hope some of those Seniors that move into affordable housing free up more homes for families to purchase. I wanted to add...to an overly long, unedited comment already of course...that I do help with disabled seniors and will continue to. I believe so many Seniors have much experience and wisdom to share with their younger local citizens and are yet valuable to the community's richness and well being. It is been suggested (ooops, I mean has been suggested!) OK, I will remember to edit my next comment.